On December 26th the Russian forensic institute which was one of three organisations to have been provided with samples from the exhumation of Yasser Arafat’s remains announced that – like the French laboratory which conducted similar tests – its findings indicated that Arafat died of natural causes. So to recap, two of the three institutions (Russian and French) which carried out tests ruled out poisoning in favour of a natural cause of death, whilst one (Swiss) said that its findings “moderately supported” the poisoning theory. On December 26th the BBC News website produced one article on the subject of the Russian findings. The accompanying links to ‘related articles’ all lead to recycled items. 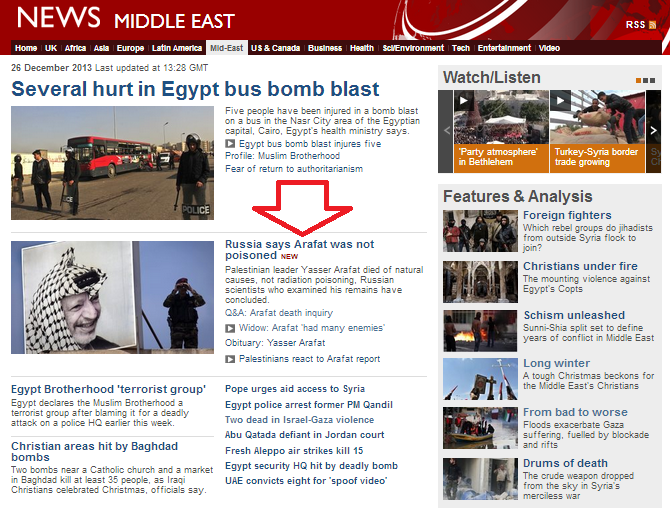 Towards the end of the report, the BBC once again opts for the promotion of Palestinian conspiracy theories. 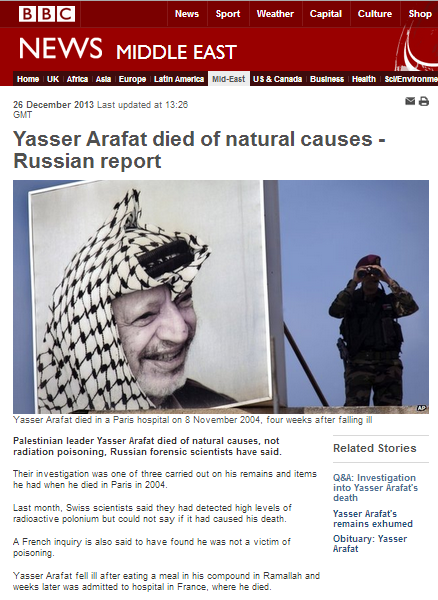 Previously, two reports were published on the subject of the French findings and thirteen related articles appeared on the BBC News website’s Middle East page in a 48 hour period on the subject of the Swiss findings, nine of which also amplified the conspiracy theory surrounding Arafat’s death. In other words, the BBC News website devoted over four times the number of articles to the coverage of findings interpreted as moderately supporting the theory that Arafat was poisoned than it did to the two other sets of findings which found that Arafat died of natural causes. The BBC claims to have a newsgathering department but it’s actually a cherry-picking department, carefully selecting the news that suits the BBC’s bias. So it’s unsurprising that the BBC places far less emphasis on a majority opinion it doesn’t approve of than on a minority opinion it likes. How true. The BBC is failing in its own mission to ‘educate and inform’ in the same way that totalitarian entities ‘educate’ selectively and ‘inform’ selectively. Yes, it fails on both those counts. It’s apparently also meant to entertain. It would only entertain me if I could find it’s failings funny rather than sad.